One of the greatest challenges of traveling with a child Little Arrow's age (16 months) is that they have a never-ending need to move. Even more so when a toddler is cursed with blessed by a rambunctious personality like he has. During our 8-hour drive to Lake of the Ozarks in Missouri last week, I knew I needed to plan the a good break point for him to really get his fill of exploration on his own two feet (and out of his car seat). 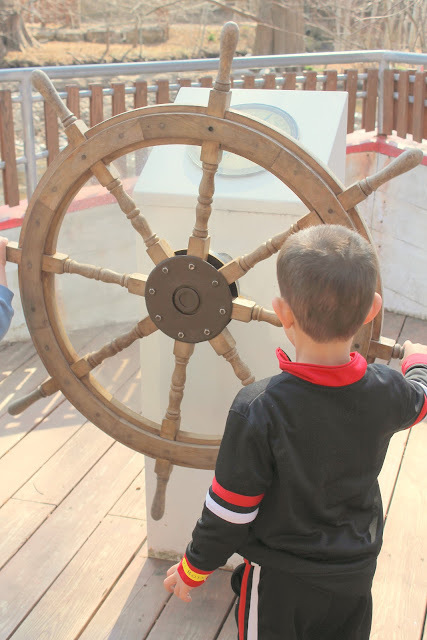 Fortunately, recommendations for the Children's Garden at the Missouri Botanical Garden in St. Louis popped up from two of my go-to family travel blogs, The Mother of All Trips and Visit Flyover Country. My husband was convinced I merely wanted to visit one more botanical garden in my quest to see them all. Always a naysayer, that guy! Unfortunately, we didn't have enough time to explore much of the gardens outside of the children's area. 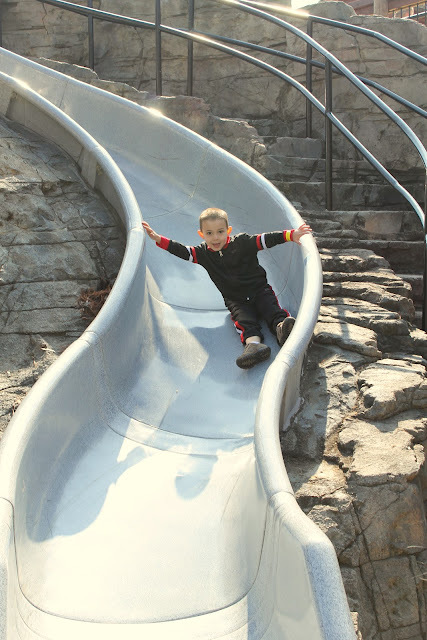 But I can still attest that this is an ideal outing with two little ones. We parked the stroller at the entrance to the children's garden (which is completely gated off from the rest of the park), and let the boys loose for several hours. 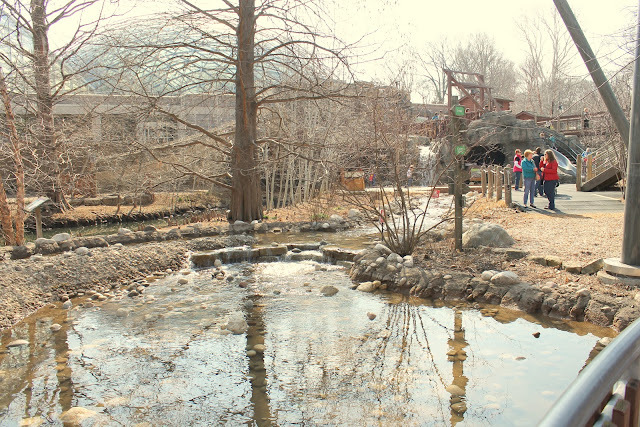 The Children's Garden is a pretty amazing play area, coming from a mom who knows her way around a playground or two. 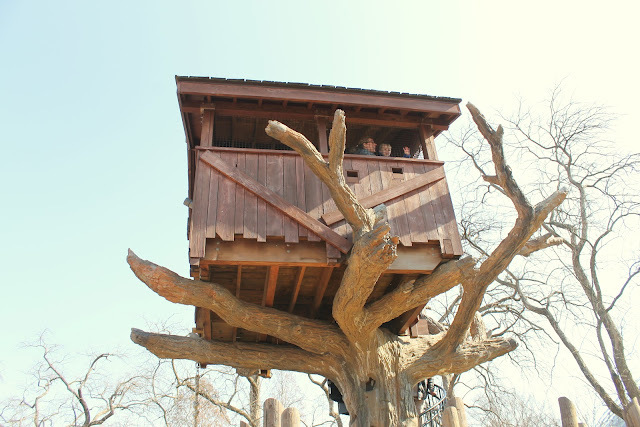 I loved how this tree house was tucked away for kids to climb up to. And there was a lovely stream running through, where kids could get involved in building locks and dams. Beyond natural elements, there was just so much "fun" kid stuff. Like this music area, where the boys actually played together. Shocking. Big Arrow, who is deep in a pirate phase that we may never crawl our way out of, could have spent hours steering his ship through the wild seas. In fact, whatever your child is "into," they probably have something for them. Climbing structures. Play food and a play store. Even a cave, complete with working head lamps for kids to use! Our only behavior issues with our wild young explorer were his efforts to climb into the water. And his desire to throw (and sometimes eat) all the mulch. But doesn't he make acting naughty look so cute? In the end, even my skeptical husband was a believer that this place was an awesome day trip for families with kids of all ages. And certainly, it would make a terrific stopping point on the way to other destinations around the Midwest. 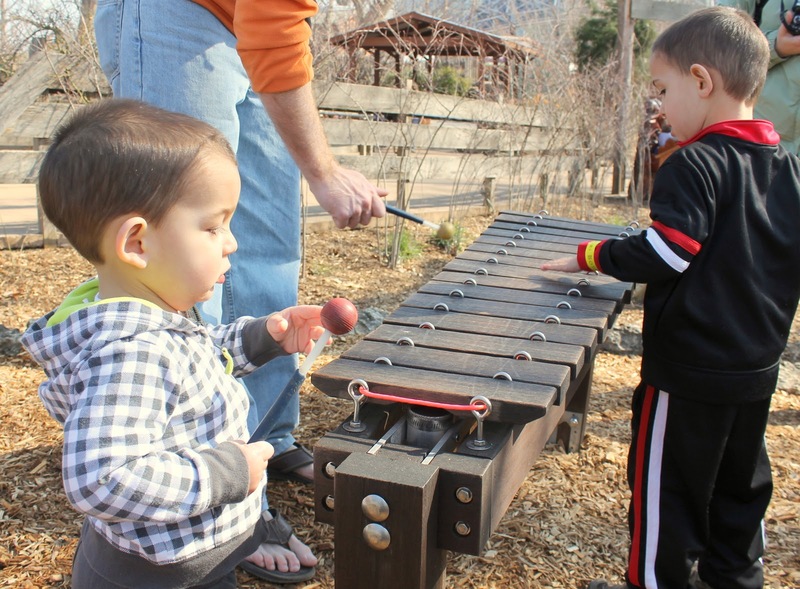 -The onsite restaurant is nice, has a good kid's menu, and a huge patio for outdoor seating. -If you're visiting in the summer, pack your swim gear or a change of clothes. There are a couple of splash pads/water play areas in the Children's Garden. -While you won't really need a stroller within the Children's Garden, it's quite a walk from the entrance. If you've got little legs in your crew, make sure you bring it. -Pick up a map as you enter. The entire complex is huge and we got lost on our way out! 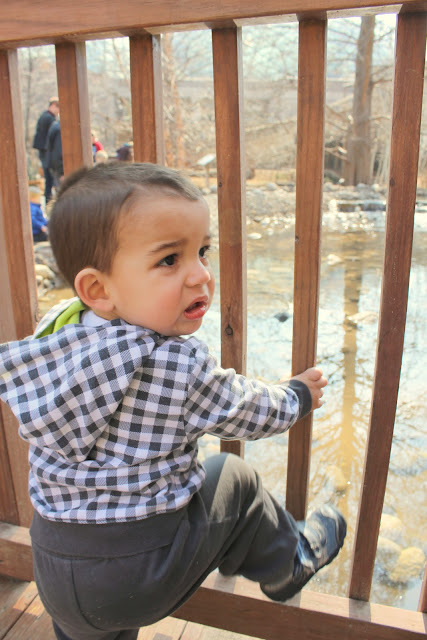 This post is a part of Photo Friday at Delicious Baby and Travel Tips Tuesday at Suitcases and Sippy Cups and Walking on Travels. 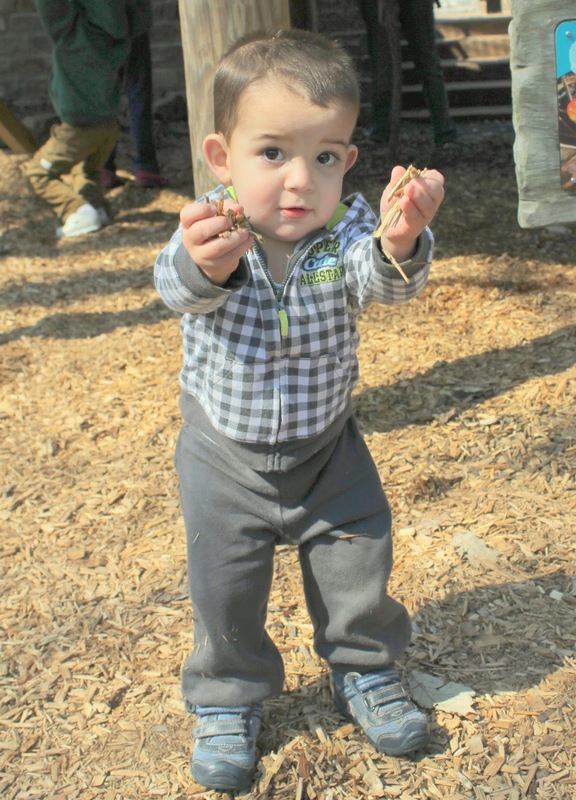 Disclosure: The Missouri Botanical Gardens hosted my family for their Children's Garden preview event. The Children's Garden opened for the season the day we were passing through town. All opinions are my own. We love the children's garden...literally go every Sunday. We've been members of the garden since college & I'm actually on one of their boards....needless to say we love the place! For food, the brunch at the Spink Pavilion is the best (and as you said the main restaurant, Sassafras, is good to). The gardens are amazing in the summer, and during a heavy snow. You must come back! My heart! Little Arrow is so cute. It was so hot the day we were there (in the heart of summer) - it's fun to see what it looks like at a different time of year. I'm glad you enjoyed it - it was certainly a hit with our family. I think we liked it better than the Magic House. Oh fun! :) I love when outdoor spaces go all out for the kiddos! The world hopes for even more passionate writers such as you who aren't afraid to say how they believe. All the time follow your heart. Personally, I'd just let him swim in the water and eat the mulch. He is just toooo cute! Kids just love these huge rambling playgrounds. It keeps them occupied for hours. Love the look of that tree house my son would love it. Well it looks most enjoyable for the kids, just look at the big wide smiles on their faces! Happy 4th Birthday, Big Arrow!